Now the weather has improved (YAY! ), it means that the task of tidying the garden and other parts of your property is fast arriving. Once you’ve done all the weeding and throwing out of garden debris, the last job is to clean the decking/pavements/walls or anywhere else that has built up muck and grime over the wet and dreary winter months. Cleaning such as this is where the pressure washers really come into their own. 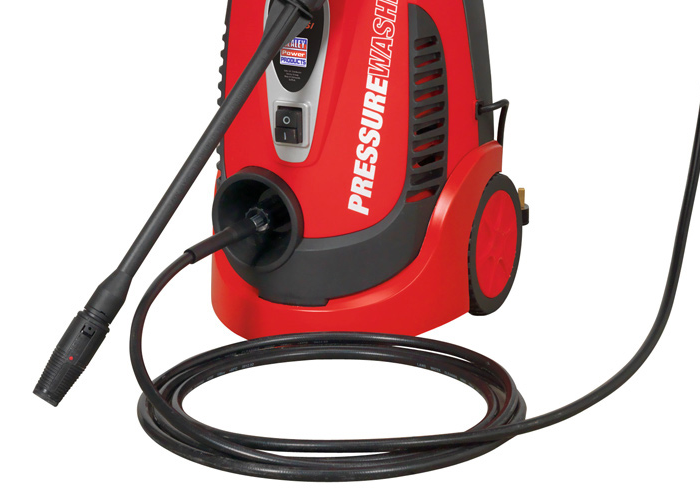 ESE Direct have just added a new range of Sealey Pressure Washers which we are sure will suit your needs. This pressure washer is designed for trade and domestic use and is commonly used to clean vehicles, motorbikes, patios and decking to name a few. The unit itself features a powerful 1300w motor which means you will get a water flow of up to 318 litres per hour and it has a maximum pressure output of 110bar. It comes with an accessory kit which allows for effective cleaning at a larger 187bar. The accessories include: variable nozzle, patio brush, rotary brush, fixed brush, detergent bottle and rotablast nozzle. It also features durable wheels meaning you can easily move the pressure washer to where it is needed, even over rough terrain. These heavy-duty pressure washer units are designed for trade use as well as domestic. These are ideal for cleaning moss covered paths or external walls, decking and vehicles. The units have either a 1400w motor and 120bar or 1700w motor and 150bar giving you a water flow option of 360 litre per hour or 402 litre per hour. Both unit sizes come with variable nozzles, a built-in detergent tanks as well as the rotablast nozzle which is able to produce a cleaning power which can rival larger and more expensive pressure washers. Again, the units have durable wheels making this easy to manoeuvre when needed. Proving to be one of our more popular pressure washers already the semi-professional unit is ideally suited to commercial use and extensive domestic cleaning such as cleaning walls, paths, patios and vehicles. The units are both fitted with a powerful induction motor which means you will be able to generate a water flow of at least 400 litres per hour (438 litres per hour for the larger unit). Both unit sizes come with a variable nozzle, and a rotablast nozzle which boosts the effective cleaning power and can rival that of a larger and more expensive pressure washer. It also features a Total Stop System for your safety. The units are also fitted with heavy duty composite wheels so you can reposition the washer without lifting it, even over rough terrain. This professional pressure washer gives you high performance, and is specifically designed for rigorous domestic, industrial and even agricultural use such as cleaning tractors, cars, ATV's, patios, and external walls to name a few. Like the semi-professional pressure washers both the units are fitted with an induction motor which provides water flow of up to 10 litres per minute with a maximum pressure of 160bar. Both models come with accessory storage located on the back of the main body and are supplied with a variable nozzle, 1.2 built-in adjustable detergent tank and a Rotablast nozzle which as mentioned with previous units allows the same effective cleaning as larger pressure washers. If you have any questions about our pressure washers please feel free to call our friendly and award-winning sales team on 0808 163 3704, or speak to them online with our LiveChat! Service.